or " Heppelwhite " sofa ? The very suggestion seems absurd, and jars terribly on our sense of consistency. As we fail, therefore, to find refinement, or what we now look upon as refinement, in any great degree in the essentials of the daily life of the times whose domestic appointments we are studying, it is hardly reasonable to look for that quality in the material environment of that life. We will not, therefore, waste our time in so doing, but will make the best of that which is presented for our examination; and the "Jacobean" chair will furnish us with ample food for reflection. The fact that, at the present day, the crafts of chair making and upholstering, and of cabinet making, are kept quite distinct, will be unknown, perhaps, to some of my readers; but there are many indications in the work before us which lead us to suppose that, in the days of " Good Queen Bess," and of her immediate successors, the one craftsman could, and did, turn out a chest, a cupboard, or a chair with equal facility, as occasion might require. The manufacture of chairs in those days did not, by any means, call for that high degree of technical training and efficiency which is demanded of the modern chair maker and upholsterer. The back, seat, and legs were made and put together in much the same fashion as the various parts of the old 11 carcase work," while upholstering was nil. As illustrative of this I will refer to one or two of the types shown in the last chapter—Figs. 3 and 5, Plate II. ; Figs. 1 and 5, Plate HI. ; the high-backed chair, Plate IV. ; and in this chapter to Figs. 1 and 2, Plate I.; Fig. 5, Plate II. ; Figs. 1 and 3, Plate III. ; and Fig. 4, Plate IV. Fig. 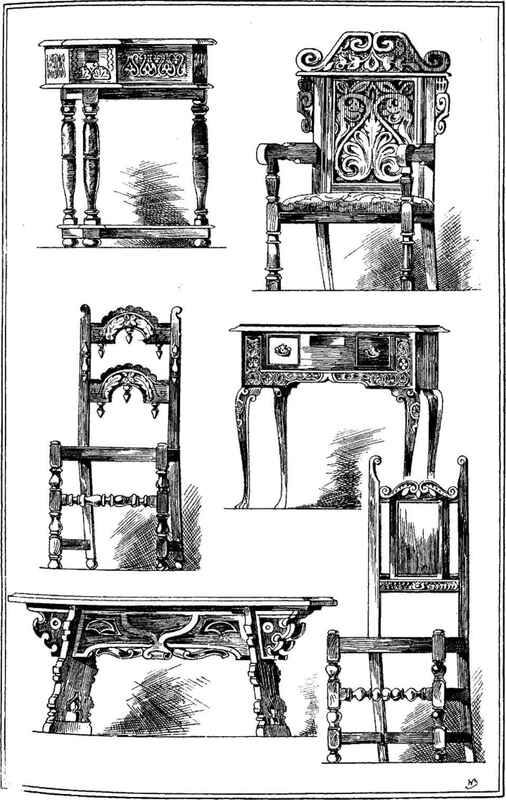 r, Plate I., which dates from late in the century, is a chair and table combined, the back being hinged to the arms and swinging over so as to form a table top, on the same principle as that illustrated in Fig. 6, Plate V.—also a late example. 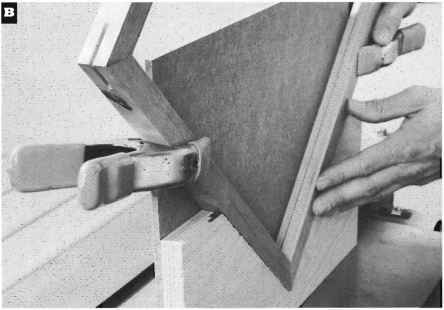 The chair shown in Fig. 2 was probably made some time between 1650 and 1670, as also those in Fig. 5, Plate II. ; Figs.